The Beatles graced many a stage through out the early 60s and on 8th September 1962 they played at the Birkenhead YMCA. Ringo Starr had officially joined the group replacing Pete Best only weeks before hand! The original stage has been divided into a limited number of pieces, giving fans a chance to own a small piece of Beatles history. 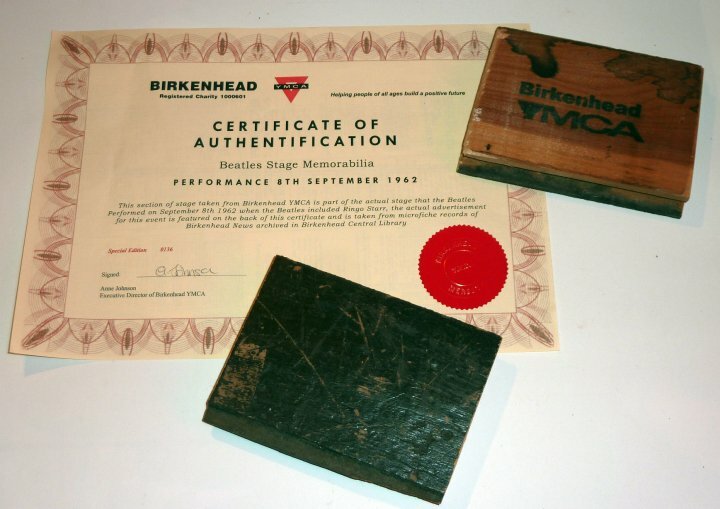 The piece of stage is stamped with the Birkenhead YMCA logo on the reverse and comes complete with a certificate of authenticity which features a reprint of the original advert for the show as published in the Birkenhead News at the time. This item carries an estimate of £50-£70.